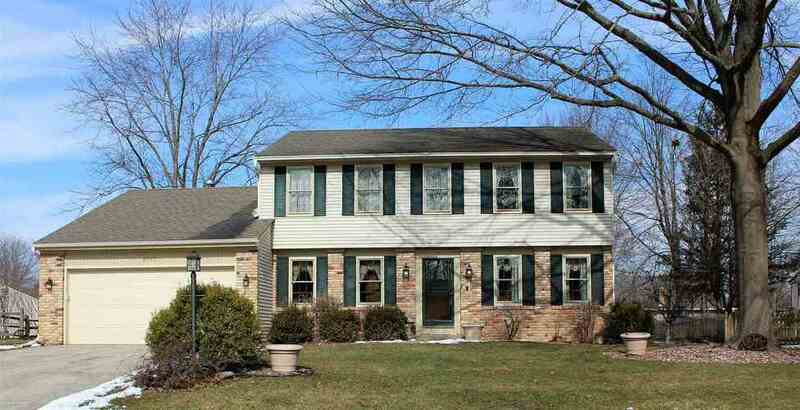 Real nice traditional two story home in strongly sought after Arlington Park neighborhood! Four bedrooms up plus private main floor den right off the foyer! Formal living and dining rooms with gleaming real wood flooring and crown moldings! Kitchen with raised panel cabinets (a few with roll out shelving)! Backsplash and vinyl flooring added in 2012! Cozy family room with brick fireplace with both a brick hearth and wood mantel that run the length of the wall! Large screened in porch that opens to a good size patio and nice views of your yard, and sidewalk leading to all of the walkway paths around the neighborhood! Basement is finished off with drywall, a berber type carpet, and drop ceiling – there was a small leak in one corner area of the basement wall that has been addressed. Lots of storage in basement. All new Pella windows and slider patio door in 2012! New gutters and downspouts in 2012! New water heater in 2015! New disposal and GDO in 2018! New dimensional shingles with tearoff done in approximately 2008. Six paneled interior doors. Seller is selling home in “As IS” condition and Buyer will need to sign “AS IS” Addendum at time of Purchase Agreement being presented. Of course Buyer is free to have any inspections on or about the home that they may desire to satisfy any concerns they might have. HMS Home Warranty also being provided by Seller to Buyer at time of closing. Home has been lovingly maintained by original owner!! Directions:St. Joe Center to first entrance into Arlington Park. Left on Potomac and follow around to Greenwich Ct.